Let’s face it; everyone likes to eat out. Whether it be once a week or once a day, everyone will buy some food from a shop for lunch or dinner (on the go or eating in). However, there are challenges that accompany this. How can you continue to work towards a goal whilst out of the comfort of your kitchen? The key to this is making smart choices and opting for certain foods over others. Continue reading to find out the best strategies to meet your goals whilst on the go. Prior to going out to eat in Petts Wood or Chislehurst, plan what you are going to eat. You can do this by organising the restaurant with your partner or whoever you are going to dinner with, then looking online at the menu. Menus nowadays often have nutrition facts and therefore make it really easy to keep to your plan. Always go for high protein, wholemeal carbohydrates when possible, double the vegetables (extra side dish), and ask for things without butter or cream as these are where the hidden calories are. Avoid creamy sauces. Drink water or gin/vodka with slim line tonic/diet lemonade (if you must drink), but be aware that alcohol slows digestion and increases fat storage. 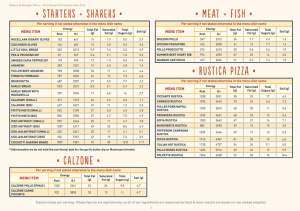 Below is an example of Zizzi’s nutrition facts menu. If there are not any healthy options in your chosen restaurant, prepare to compensate later or earlier in the day. For example, if I know that the restaurant I am going to will have a high fat content in the meals, I will have low fat meals before and after to save the extra calories for that meal. Part of my practice is that I provide examples of local restaurants near work, house or wherever you desire that you can eat at, including specific meals. Not only that, clients like to contact me any time of the day via phone to check what they are ordering is correct. If they don’t know what to order, I will look at the menu and give a number of suitable options for you to choose from. None of my plans or advice are based on restriction. It’s all about balance and sustainability.